Fujiko Shiraga was born in Osaka Prefecture, Japan in 1928. She graduated from Osaka Prefecture Otemae High School in 1946 and two years later, she married Kazuo Shiraga (1924-2008). Fujiko and Kazuo Shiraga were both members of the avant-garde art collective Gutai. 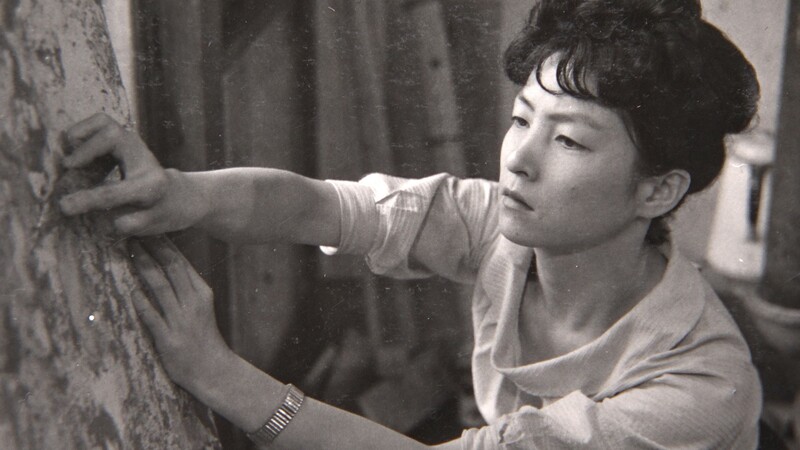 Like many other Gutai artists, Fujiko received no formal training as an artist and her earliest extant works date from 1955 and came under the guidance of Gutai founder, Jiro Yoshihara. During the latter half of the 1950s, Fujiko’s experiments with paper yielded collages. She wetted and glued large sheets of monochromatic Japanese paper of different weights and transparencies before manually distressing them with concave and convex forms pressed with her hands. She would then tear through several of the layers of the conjoined paper to leave a semi-transparent vertical slit. On other occasions, while using the same multi-layered distressed paper, her torn patterns became entirely free-form. Her paintings from 1957 and 1958 took the form of vertical stripes of silver paint on dark ground and gravity-fed rivers of diluted green pigment on raw paper which were then mounted and displayed on boards. In 1960, Fujiko started to work on stretched canvases where she added encaustic wax to her abstract compositions as a bonding and pigment bearing agent. She also started to include broken glass within her paintings, which paradoxically ushered her solo career to an early end in 1961 as the incompatibility of Fujiko’s new material and her husband’s bare-foot painting technique became apparent. Simultaneously, the commercial success of Kazuo Shiraga’s paintings in Europe encouraged the couple to adopt a studio practice where Kazuo painted while Fujiko prepared the oil paints and advised on the colors to be used. This practice continued for the rest of Kazuo Shiraga’s career. The singularity and distinction of Fujiko’s work created between 1955 and 1961 posits unanswerable ‘what if’ questions. However with the recent rediscovery of a group of twenty of Fujiko’s paintings and paper collages, the visual and philosophical affinities of her monochromatic work with Barnett Newman, Piero Manzoni, Yves Klein, and Lucio Fontana can be explored. 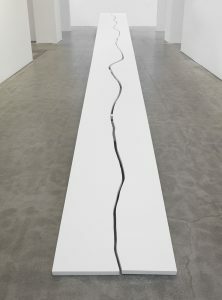 Fujiko Shiraga’s work has been exhibited in every major Gutai survey including most recently those at the Solomon R. Guggenheim Museum, New York (2013); New National Museum, Tokyo (2012); and Museo Cantonale d’Arte, Lugano (2010). She passed away on January 17, 2015 in Amagasaki, Japan.